There’s an intense feeling of pride when you accomplish something you could never do before. I am in no way a good cook. I never really learned how to cook and for a long time, most of meals came out of a box or from the freezer. Learning how to eat in a healthy way started the evolution of food for me. Now, I want to eat healthy, real foods that provide me with the nutrients I need to be fit and active. Living with Michael, who can create recipes off the top of his head, has made me excited to cook things in the kitchen. 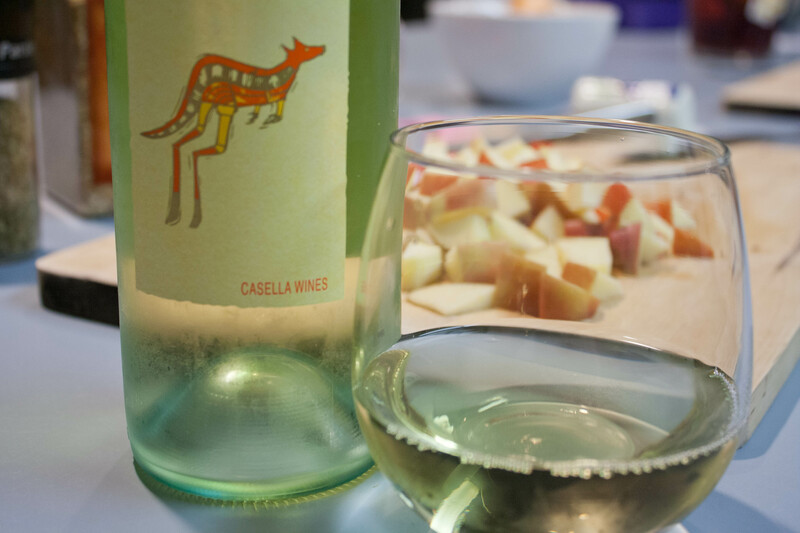 This weekend I created a recipe all my own. I was asked by Barilla again to create something with their pasta because they really liked my last recipe creation. 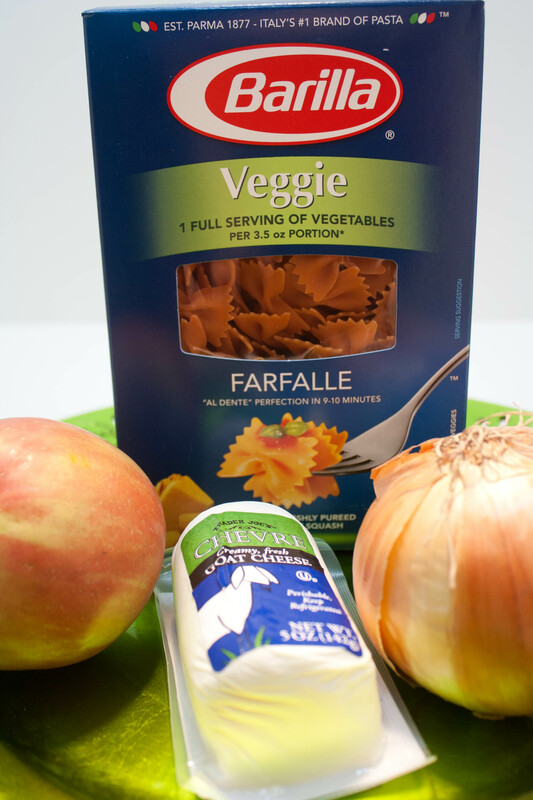 The reason I said yes was because I was intrigued by their new product line: veggie pasta! They have three new pastas out that are made with vegetables. The rotini is made with zucchini and spinach, the penne is made with tomatoes and carrots and the farfalle is made with carrots and squash. They sent me a box of the farfalle and that’s what I used for this recipe. I was so fascinated by the concept. Pasta enriched with vegetable and providing a fill serving of vegetables? That’s awesome! Especially for people who may not be veggie fanatics like myself. The farfalle was orange in color and I was curious if it would taste sweet like carrots and squash. Ooops. Michael suggested we chop up some sausages as a replacement to the crispy walnuts to add some protein to the dish and to balance out some of the sweetness of the apples and onions. That was a good call. The apple chicken sausage we bought at Costco recently was delicious! I don’t know that we’ll buy anything else in the future! Cut the onions into medium length pieces. Cut the apples into bite size chunks. Caramelize the onions in a skillet with butter. 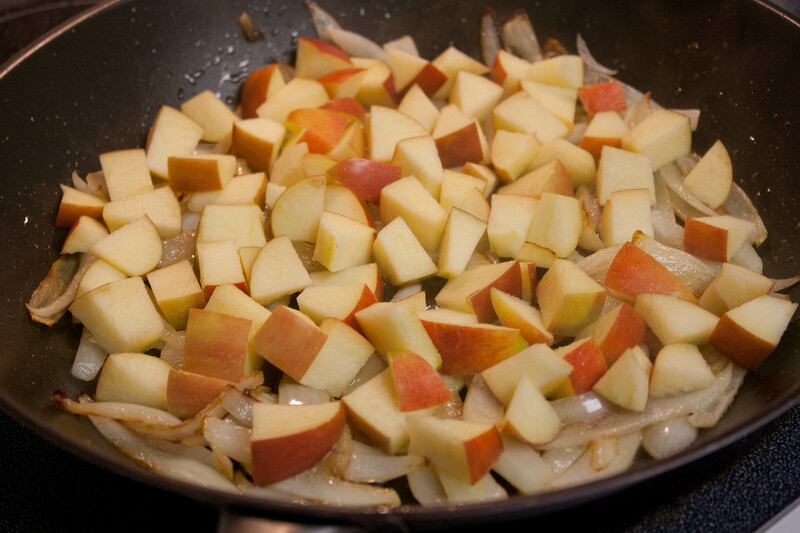 Do not add sugar to the onions to caramelize them, the apples will release enough sugar for that. When the onions are almost caramelized, add the apple chunks to cook with the onions. When the apples have softened, it's done. Cook the pasta in a large pot of water for 9-10 minutes. Reserve some of the water. Drain. 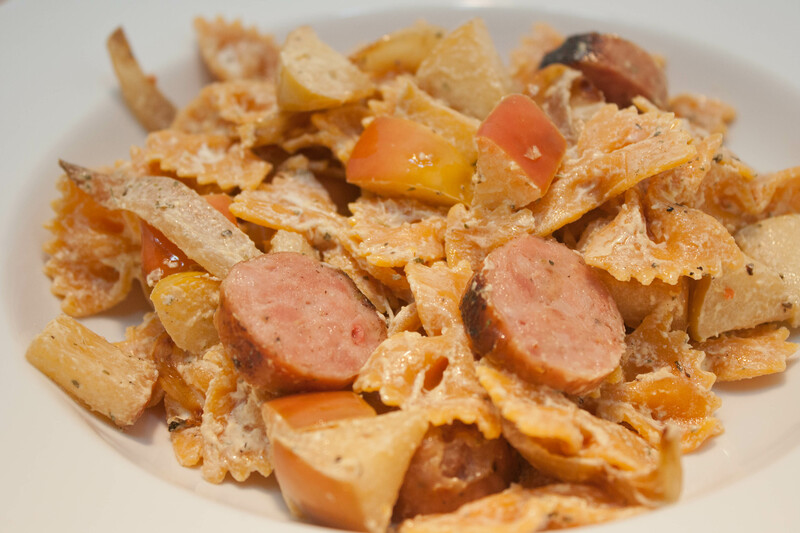 While the pasta is cooking, boil some water and cook the sausage links for about 7 minutes, then cook the sausage links in a skillet until browned. Pour the pasta, onions and apples into a very large bowl. Add the goat cheese crumbles to the bowl and mix well until the pasta is all coated with cheese. Add some of the reserved pasta water as needed. Season with salt, pepper, parsley and Italian seasoning to taste. 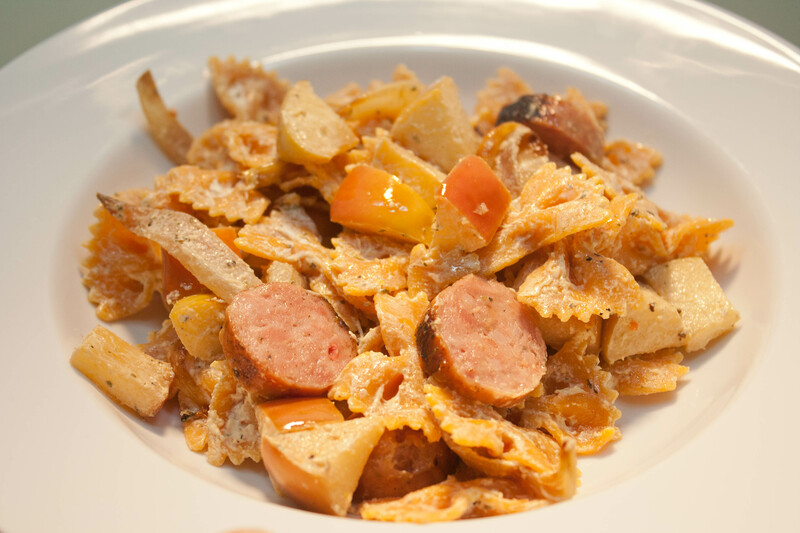 Chop the sausage into chunks and add to the pasta. Mix it all together and serve. 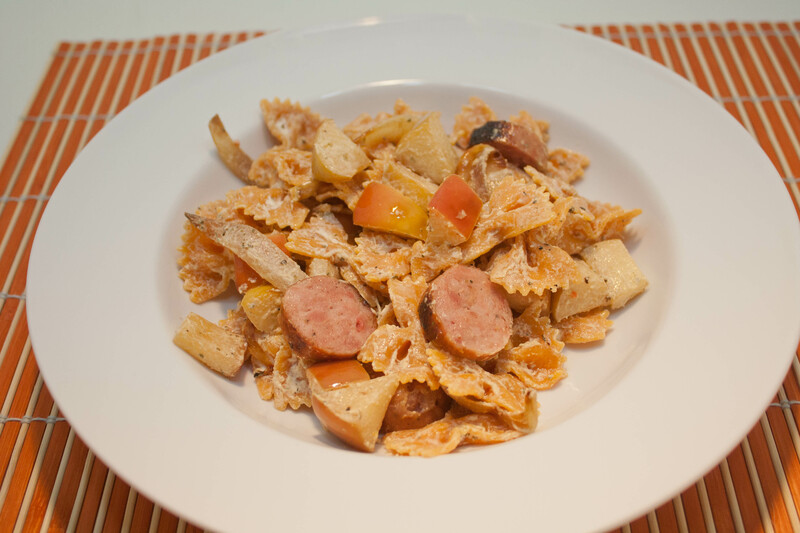 The onions were caramelizing in the skillet while the sausage cooked and the pasta boiled. The aromas that were coming from the onions and apples were fantastic. According to Michael, whenever I make a new recipe I say “I hope it’s edible.” I never said that with this recipe because I could tell it was going to be delicious. I mixed everything together in a big bowl and added the goat cheese and water from the pasta pot. The cheese melted into a creamy sauce and coated the pasta. I added a little bit of salt and pepper to balance the sweetness of the dish, as well as some dried herbs. It isn’t often that I make a recipe that I love so much that I cannot wait to eat the leftovers. I loved my dish! It turned out so great and it made me feel confident and proud that I could create something from scratch that actually tasted fantastic! I loved the balancing act of the sweet and savory. The sausage had a hint of sweetness to it, but not too much and the goat cheese evened out the rest of the sugary flavors. It was not overpowering at all. I bet sauteed kale would be a great addition to this recipe, too. Give this recipe a try, you won’t be sorry! 1) Follow me on Twitter and tweet: “I want to create my own pasta recipe with @BarillaUS pasta from @lisaeirene at http://wp.me/p116Lc-96j″ Then leave a comment here telling me you did so. 2) Join my Facebook page and leave a comment here telling me you did. 3) Leave a comment telling me what recipe you would create. 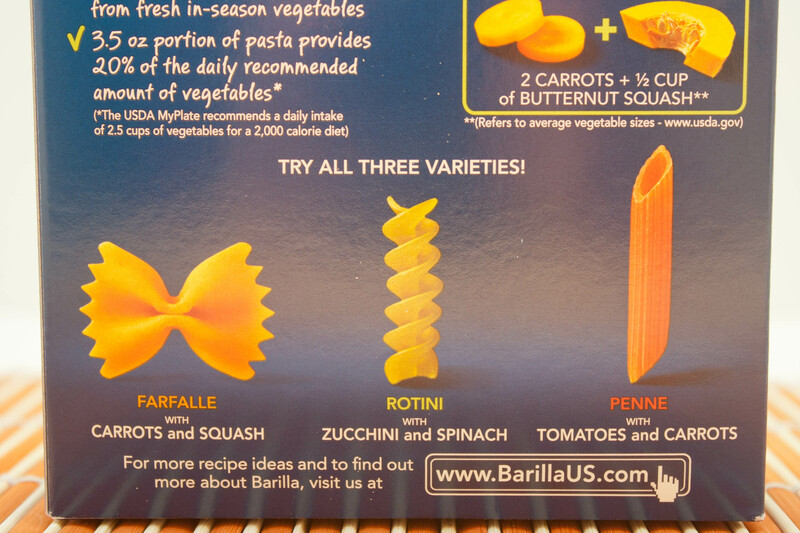 DISCLAIMER – WHILE THE PRODUCT WAS PROVIDED TO ME FROM BARILLA, MY REVIEWS AND OPINIONS ARE ENTIRELY MY OWN. Wow, that sounds delicious! Did the pasta have the normal pasta-y texture to it? Esther recently posted..On the Instablog: Deep sea girl. It tasted exactly like normal pasta! I already follow you on twitter and facebook!!!! I would copy your recipe you make here but I’m vegetarian so I’d use a soy meat. I would make your recipe, maybe add some butternut squash to it as well. Love the addition of the apples. Butternut squash is a great idea! I joined your FB page! For a recipe, I’d make a sauce out of tomato, basil, garlic & onion. Shrimp for protein. And fresh parmesan on top! Mmm that sounds really good! So I’m making up my own recipe tonight using farfalle – it’s turkey sausage, fire roasted tomato sauce, cottage cheese, broccoli cuts and pasta. I hope it’s good! 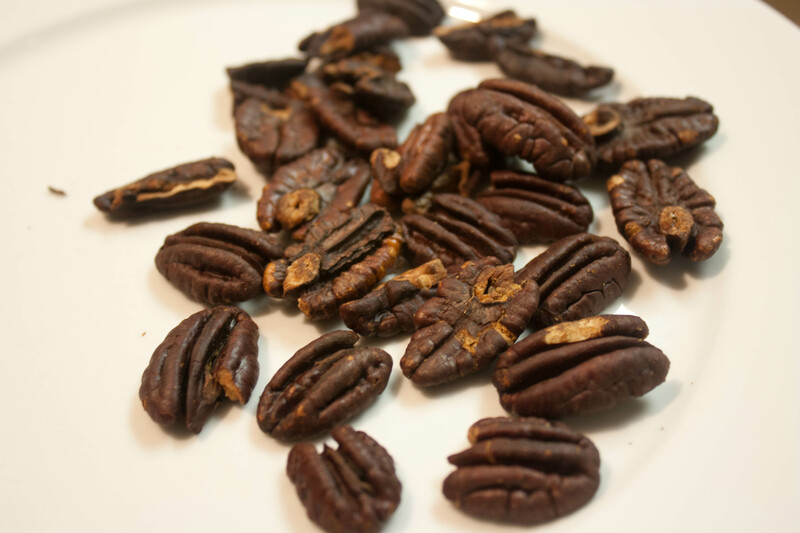 I think you burned pecans. I’ve not toasted nuts because I have a fear of burning them! Oh yea they were burned!! Your recipe sounds delicious. What a great idea to use cottage cheese. It was really good! I liked it a lot and will definitely make it again. I think it would be a good carb-loading dinner the night before a race. Do you have a recipe for that sauce? It sounds really intriguing. I love funky pasta shapes and flavors! I would make my fiesta pasta – lots of peppers, zucchini, and summer squash, cheese, and ground chicken. Yum! Ali @ Peaches and Football recently posted..AHHHHH SNOW!!!!! Yum! Ground chicken is a great idea.